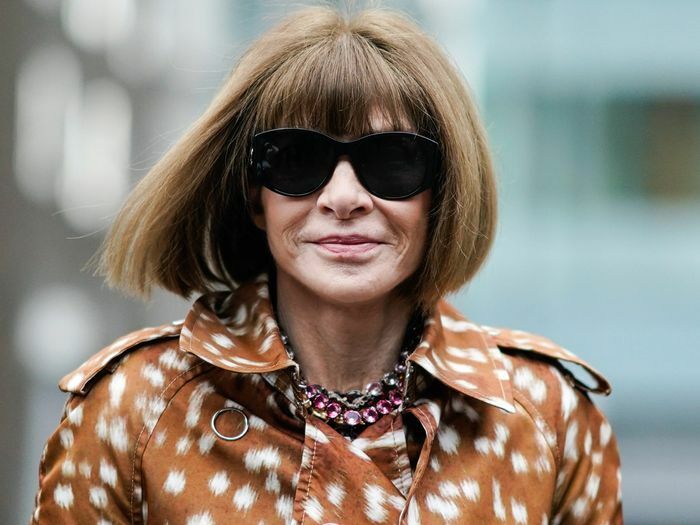 Anna Wintour rarely speaks to press, so when we caught wind of a new interview she did with CNN, you can bet we devoured every word. None other than Christiane Amanpour interviewed the Vogue editor in chief, who is on the promotional tour for the upcoming Met Gala. She discussed a slew of different topics, including sustainability, diversity, politics, and how social media has changed fashion. Oh, and she also confirmed that, no, she has no plans of ever taking off her signature sunglasses, which she explains are "incredibly useful because you avoid people knowing what you're thinking about." What caught our eye, in particular, was Wintour's discussion of criticism. "Sometimes there has been a certain level of personal criticism directed at me that, possibly, might not have been [used against] a man in a similar position," she told CNN. So what's her trick to surviving those unwanted opinions? "I'm very focused," she said. "So I, maybe because of my clarity and my focus, haven't let it in." We can't all be as decisive as Wintour, but it's certainly a wise suggestion to put your blinders on and concentrate on what you're doing with laser focus to prevent letting criticism to get to you. Thanks for the reminder, Anna.